Garden Spells and The Sugar Queen by Sarah Addison Allen. I have just fallen in love with this author. Both of her books are whimsical and mysterious along with a little romance. Perfect summer reads. Her next book isn't coming out until next year and I can't wait! Both are easy reads and are like little pieces of candy. I just loved them!! Water for Elephants by Sara Gruen. I enjoyed this book about the circus and relationships, but fell in love with this book because of the ending. There were pieces of it that were sad and hard to read, but in the end it made you feel warm inside. A spectacular look at circus' from the inside. Three Cups of Tea by Greg Mortenson and David Oliver Relin. A nonfiction book about a mountain climber who falls in love with a small village in Pakistan. He decides to help this village out by building it a school. From that decision on his life completely changes. This book was a hard read for me. Very slow at the beginning but the over all message against terrorism and for world peace is inspiring. The Kite Runner by Khaled Hosseini. This has been my 2nd recent book about the Middle East. It is fiction, but makes you really feel a sense of what life is like in Afghanistan and bordering countries. Another sad book at times, but an enlightening read. We went strawberry picking this past weekend. I thought Shane might enjoy the experience and we'd enjoy having some fresh yummy strawberries around the house. Sadly, the strawberries ended up not tasting so good. I've had to sweeten them up a whole bunch. I made a strawberry cobbler, we've had strawberry waffles and strawberry shortcake. We didn't even pick that much, but we have strawberries coming out of our ears. We didn't mention to Shane one way or the other about eating them. For some reason after he would pick one, he would pretend to eat it and then put it in the bucket. I don't know where he comes up with this stuff! Dry Erase Board -- Made from a picture frame. A dry erase marker just rubs right off of it. I must say, I'm in LOVE with this. I made it to sell at a vendor fair I'm dong in a couple weeks. This one is going to be hard to part with. The paper I used is called Bella and of course is from Close To My Heart. This is a large sized can that I altered. Not sure exactly what I'm going to use it for, but I could put a gift in it, or use it to hold scrapbooking or office stuff. That is why the tag is still blank. Our Other Two Members of the Family. Sadie Rose and Dodger Dog are two very important members of our family. I thought I'd give them their own blog for today. Shane does wonderful with them, and in turn, they do well with him. Granted Shane only knows having them in the house. Shane sure is an animal lover of all sorts. I've veered off topic here though....this is suppose to be about Sadie and Dodger, not Shane. Both of our furry monsters are loved by all in the household. My favorite thing to do with Dodger is to cuddle with him in the mornings and he is a fabulous nap partner. Sadie is fun to play with and tease. She doesn't mind being dressed up or other odd things we manage to do to her. As long as someone is touching her, she is one happy dog. Dodger taking a load off this afternoon in the hallway. Sadie's newest nap location...the bathroom?!?! *We just got home from the gym. *Shane is playing with his farm. *I hopped on the computer to look up a phone number and got completely side tracked....which is typical. *Headed to take a shower and get ready for an afternoon at work. Outside my window...I replanted Shane's sunflower. I am thinking...about watching Jon and Kate Plus 8 tonight and am feeling sad about the impending announcement of divorce for them. I am thankful for...being able to take a nap today (with my trusty nap buddies, Sadie and Dodger) and that I could catch up on stuff while Shane was awake. From the kitchen...green chile chicken enchiladas (a new recipe "stolen" from Betsy). They were yummy!! I am wearing...my go to Roxy red sweatshirt ('cause it was icky and gray out this morning), green warm-up pants (3rd pair of pants for the day) and socks. I am creating...a make and take for an upcoming vendor fair in July. I am going...to have a Milky Way while I watch Jon and Kate. I am hoping...that Shane is in a much better mood tomorrow. I am hearing...Shane crying in his crib and the dishwasher going. Around the house...it has been picked up from the events of the day and all ready to be turned upside down once again tomorrow. A few plans for the rest of the week...work tomorrow, gym and work on Wednesday and Thursday, CTMH meeting Thursday night and ahh...Friday. One of my favorite things...watching Shane play quietly and happily with his newly "scored" Lego Duplos while he watches golf on tv. We had a nice Father's Day weekend around here, even if the weather decided to rain. Saturday morning Kenny decided we should go check out some garage sales. I had stopped at one Friday morning and had scored a few things for Shane (2 shirts, a box full of little metal tools, stuff for his kitchen and crocs...all for $5). He was inspired by my finds. Our garage sale adventures didn't start out so well, but Kenny was determined to end it with a success. At our 5th or 6th stop, we scored. We found two big bins of Lego Duplos, a bin of Lincoln Logs, a bag full of kid sized metal silverware, a few items for his kitchen, and a bath toy....all for $11!!! We also got him a little baseball glove for a $1 before this. Shane kept asking to go to more. He was having a great time checking all the stuff out. It was a fun little family adventure on a gray Saturday morning. Saturday night we went to a surprise birthday party for one of Kenny's coworkers. We had some yummy food, and Shane loved swinging and dancing to the 70's band. He even got to stay up past his bed time. Sunday morning around 2:30am, Shane woke us up with some ear piercing screams. He had a fever of 102.3 and wasn't feeling good. We got him calmed down and back to bed with some Motrin in him. He woke up with a lower fever, but not totally full of energy. Kenny got Mariner baseball tickets for his birthday in April and it so happened that the first game was on Father's Day, too. This afternoon after Shane got a short nap in, we headed to the baseball game. It was Shane's 2nd time to a game, but he truly understood what was going on this year. He loved watching the plays and all the people. But by the bottom of the 7th inning he was ready to head home. You can tell in the pictures he wasn't feel his 100% self. On the ride home...his new favorite position in his car seat. Hope you had a fun Father's Day weekend, too! Here are the cards we made at my card making class last night. We made 4 cards for $5! You can't beat that price! The girls learned a bunch of new techniques and tools using Close To My Heart products. Join us next month and leave with 4 cards to add to your card stash, so when you need a card for that next special event you won't have to make a trip to Hallmark. Next month's card making class is: Friday, July 10th at 7:00. He wakes up happy. He may not stay happy for long, but those first few minutes of the morning are the best. Even better when it lasts a whole hour. His attention span is getting better and better every day. He'll go off and play in his kitchen or build a tower or play with his trains. It is so fun to watch him make believe and play on his own. He LOVES being outside. Any time spent outside is a good time. And if outside time can include water play, then it is even better. Throw in a little time with some dirt and you have a perfect afternoon. He really is enjoying books now. He'll sit and listen to you read books for as long as you can sit and read to him. He has even asked to check them out of the library the past two weeks. I really really love this! Getting new books to read to him and have him listen is so much fun. Dancing is another favorite past time of his. Currently his music of choice is Rancid. Some influence from his Dad there. He likes it loud and heavy. No baby music here! He loves talking on the phone. Pretend or real. It is so funny to watch him talk on a pretend phone. He waves hi and tells some story and then waves good-bye. He has about 60 signs he uses and about 12 words. He seems to be a little slow on the word side of things, but none the less, he is communicating all day long. At lunch today he was being silly by using a whole bunch of signs thrown together. It didn't make any sense and he knew that and thought he was really funny. He has the craziest hair in the world! Little by little it is getting better at laying down. But after he wakes up from a nap...wow...look out hair. Getting a hug or kiss unexpected from him is the best thing in the world. Shane and I had a four day weekend in Sequim. We left early Friday morning and got back home this morning. We had lots of fun just hanging out, playing outside, going to the beach, playing in water, visiting Great Grandma, and one of the biggest highlights was "swimming" in Grandpa and Grandma's hot tub. This was Shane's first time in the hot tub. It took some convincing, but he did end up enjoying himself. And even went 2 more times after that. Monday morning we took a little trip to Cline Spit. Shane has visited many beaches and has never shown much interest in going in the water. He'll happily play with his sand toys and call it a day. This time he headed straight for the water and walked right on in. Okay, I wasn't prepared for a wet trip to the beach, but made due. He spent the next 30 minutes in and out of the water in his shoes, socks and jeans having a blast. We did end up doing some shopping with him wrapped in his blanket since he was with out pants, socks or shoes. But I think if you ask him he'd say it was all worth it. Next time I'll be more prepared for time in the water. Eating Grandma's yummy yummy popcorn and chilling with Mama and Grandma before bedtime. Shane had his friends over today to celebrate his 2nd birthday with him. He wanted to keep it causal with an afternoon play date (ok, ok....I wanted to keep it simple). The weather was wonderful, so we were able to spend some time outside. Everyone had a great time playing with all of Shane's fun new toys. A big thank you to everyone for making his 2nd birthday a lot of fun!! Happy Birthday to Shane! He is a big two year old today! Opening up presents this morning. Enjoying his Goodnight Moon book from his cousins, Carolyn and Meredith. Watching his favorite show Signing Time...Mom let him watch it THREE times this morning!! Eating his 1st Happy Meal ever!! Mom thought it was sorta a let down (the toy was terrible and it doesn't even come in a box), but he had fun. Shane had his two year old well baby check up on Monday. He is weighing in at 23lbs 7ozs. Which actually bumped him up to the 5-10%. At his 18 month check up he had dropped to the 3%. He is still going strong with his height....50-75%. Tall and skinny, like his Dad. He had two shots in his arm. The first time ever for the arm shots. Another reminder that he isn't a baby anymore. The little guy is doing great and growing up fast! We decided to take Shane on his first train ride for his 2nd birthday. We headed up to the Northwest Railway Museum in Snoqualmie, WA. My parents joined us since luckily the Hood Canal Bridge opened early. All week long Shane had been signing to us about the train and Grandma and Grandpa coming to go with us. He was truly, truly excited about it. It was a 70 minute long ride to North Bend, then through Snoqualmie on our way out to Snoqualmie Falls and then back to the station. Seeing the Falls from above it in the train was insane. It was a great little adventure for all! Shane signing train....which he did about a thousand times on the ride. Every time the whistle would blow he would jump and sign train. It was hard to catch his expressions with the camera, but he was so wide eyed and excited about everything. This is the top of Snoqualmie Falls. The Snoqualmie Lodge and looking down at the river. First Somersault Caught on Video. Last night Shane was dancing around and being goofy like normal when 6pm hits. I had the video camera out trying to get some dancing footage on him. All of a sudden he did a somersault. We asked him to do it again and he did an even better one the second time. And it was all caught on tape. Since then he hasn't been able to do it as good. We were laughing pretty hard that I just so happened to have the camera on. The first part of the video is of him just being silly, the somersault comes at the end. The weather has been incredible here in the Northwest the past week. Even in the 80's!! We've had the pool out, but Shane has been really hesitant to go in it. One evening Kenny "jumped" in and started splashing, so Shane decided the pool wasn't so bad after all. I know he likes water, but he just does things at his own pace. It took him a long time to actually sit down all the way in the water. Now he does his stuntman jumping thing and cracks himself up. He also likes to take his little chair in and out of the pool. In June you can take advantage of a different deal each day on MyCTMH website—a product special available only that day and only while supplies last. Specials include Great Goodies boxes priced 50% or more below retail and popular products for free with a My Acrylix stamp set purchase PLUS irresistible shipping discounts. Check MyCTMH website every day from June 1–30 for that day's deal and add to your scrapbooking and cardmaking supplies while saving a bundle. Remember, each special is good only for that day, only while supplies last, and only on MyCTMH website. Deals are available for 23 hours beginning at 9a.m. on the day announced through 8a.m. the following day or while supplies last. CTMH has specifically selected items with ample quantities on hand to make shopping a relaxed experience—CTMH recommends that you visit MyCTMH website throughout the day for a smoother shopping experience rather than “racing to the doors” each day at 9a.m. Father's Day is just around the corner. You can check out a new Art and Soul episode by visiting MyCTMH and clicking on the CTMH TV tab. This episode will help you to get ready to celebrate the special man in your life by creating a fast, fun, and manly gift to help him remember just how much he’s loved and appreciated. You’ll learn fabulous techniques like rock ‘n’ roll stamping, using a corner rounder to create fun and unique shapes, and much more. 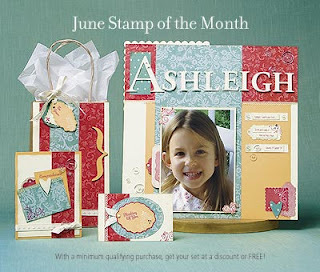 At the end of the episode the featured stamp set is even offered at a discount. Hurry on over and view this show and many others. Thoughtful messages completement these vintage tag designs, perfect for giving any package or project an elegant presonal touch. Available June 1-30, 2009 only.